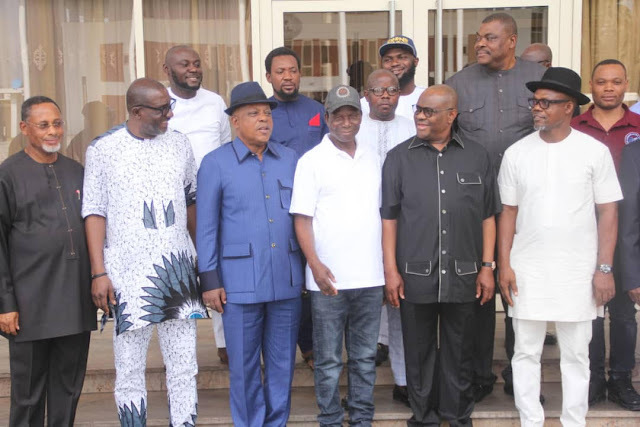 Governor Nyesom Wike of Rivers State has declared that no one man's interest is bigger than the state, declaring that all leaders must work together to move Rivers State forward. Governor Wike said: "History will be on your side. You have shown that the interest of the state is above personal consideration. God will not only protect you, He will reward you for this decision. "Rivers State is the only state we have. Everyone must work together to move this state forward. It is important to take this state to greater heights. "It is not everyone that can take this kind of decision. It requires maturity to take this kind of decision ". He said: "All of us must work together in order to forge ahead. No one man's interest is bigger than that of the State". "You are welcome to the party that will move the state forward. Those on the other side must understand that you cannot kill people, just to be in power. With this bold decision, our brothers on the other side know that the end has come", he said. He said: "This is a welcome development. This is what a normal situation is supposed to be. The people will see the reason why we must work together. This is an uncommon decision. You have taken a wise decision because you have the interest of the people at heart". He said: "Today, I am in your midst to declare my defection to the PDP. Governor Wike is a man of vision. He is a man of compassion. It is his compassion that endears him to the people of Rivers State. I choose to identify with him to move the state forward ". "I officially announce the withdrawal of my candidacy for the AAC. My loyalty is with the PDP. I cannot afford to leave the fast lane and go to the slow lane", he said.